Honeymee is the Sweet Spot to Bee Happy and Eat Real Honey Combs! - EAT WITH HOP! 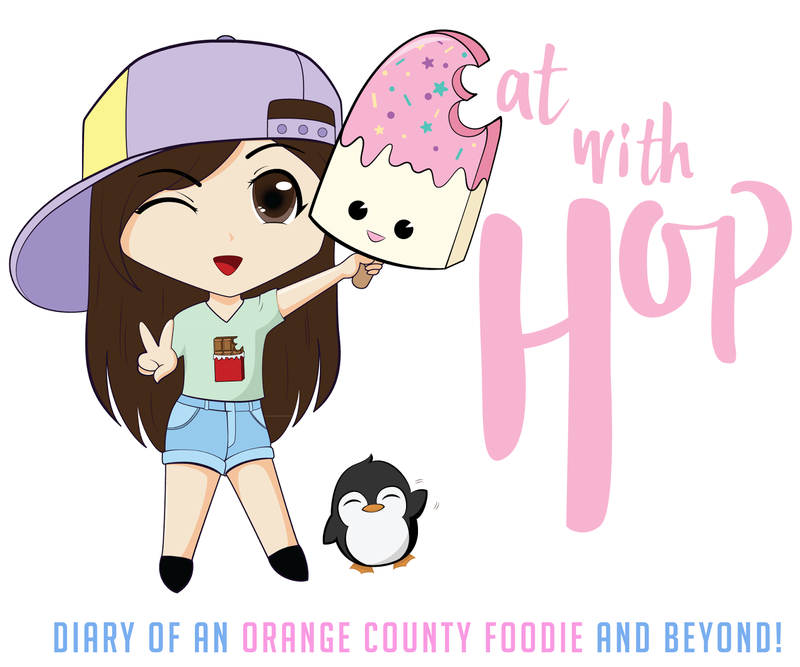 Home / CA / DESSERT / GARDEN GROVE / ICE CREAM / KAWAII / ORANGE COUNTY / Honeymee is the Sweet Spot to Bee Happy and Eat Real Honey Combs! Hey Honey. Let me eat your comb..... !! HoneyMee is one of my favorite dessert places and I love the novelty of it. Isn't it cool that you can eat an actual....honeycomb?! What?! 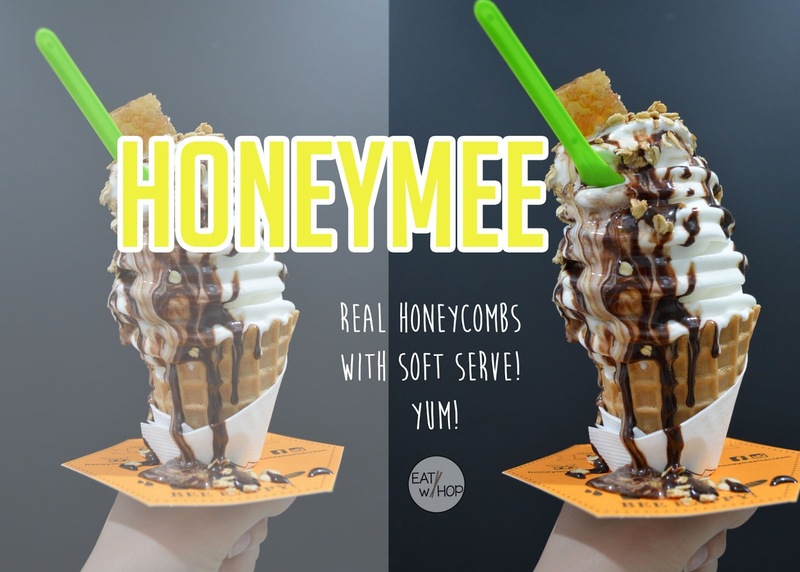 From a concept in South Korea, HoneyMee brings the trend to California to sweeten up anyone's day! We took over the HoneyMee store in Westminster (brookhurst/westminster) to play some card games and phone games with da homies. I also added extra toppings such as chocolate sauce and granola! I have been to many HoneyMee locations, and my favorite location is in Garden Grove / Westminster! Why? IT'S TOTALLY HUGE AND SPACIOUS! Most HoneyMee locations are small... or is only a stall. Not even seating! But this HoneyMee (Garden Grove) provides free wi-fi AND plentiful seating AND opens late?! For awhile me and the daiso crew would come here late nights and just chill, literally because it's cold in there haha. I haven't been to HoneyMee in awhile but I heard they have a new matcha affogato now? Must check that out asap.... I love my matcha! I always take my international friends here for dessert because of the novelty. Getting to eat an actual honeycomb is pretty cool...right?? And it's amazing that you can now experience that so easily from HoneyMee! The honeycomb itself is sorta waxy and chewy. It will get stuck in your teeth. Some parts are kinda... thick and hard and it's overall an interesting chewy and sticky experience. I personally think it's more enjoyable to get the normal honey syrup instead of the honeycomb, but if it's your first time here I recommend getting the honeycomb just for the novelty and experience! For enjoying, the regular honey! The size is quite small. You'd be surprised by how small it is for around $5 - $6. Yikes! But the true milk flavored soft serve is good. It does melt fast though... The entire dessert in a cup is about the size of my hand. That small. But if it was any bigger I'd be too full anyway. I also like the "Babe" or was it "Babee"..? It's the soft bread sandwich which has soft serve and honey in between! It's also a sticky mess but pretty good! Their smoothies are also really good too! I love the cookies and cream and green tea smoothie! So yummy! You can really taste the distinct honey in them! 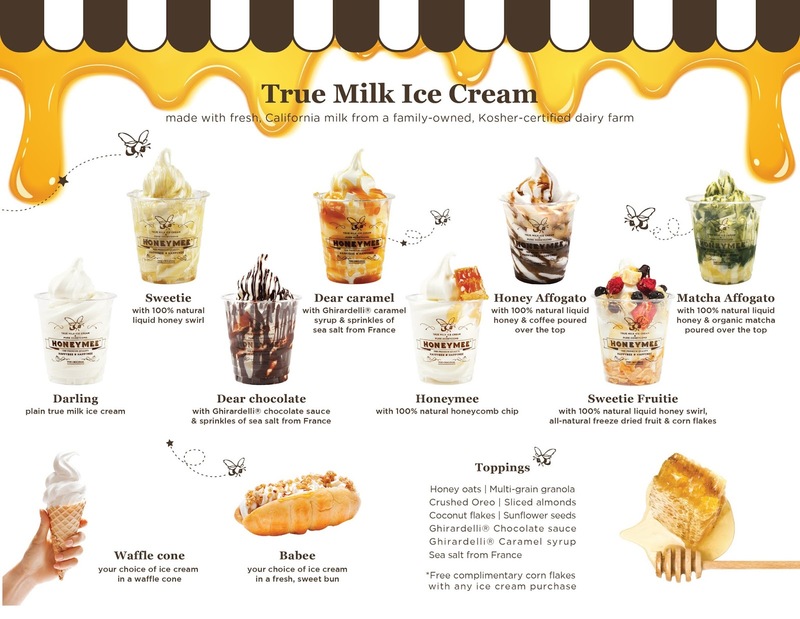 If you have the chance to go to Korea, you'll see a ton of dessert shops that sell honeycomb desserts! Whoa! Looking at their menu online, it seems like they've add so much more to their menu! They have many locations! Check the rest here.